The 130 foot dish at OVRO. 50 years old this year. “Light takes time to reach Earth’s observatories from the depths of space, and so you see objects and phenomena not as they are but as they once were. That means the universe acts like a giant time machine: the farther away you look, the further back in time you see—back almost to the beginning of time itself. Within that horizon of reckoning, cosmic evolution unfolds continuously, in full view.” — Neil deGrasse Tyson, Astrophysicist. It’s called “The Big Ears” and it’s picking up naturally occurring signals from outer space. The Owens Valley Radio Observatory (OVRO) has a variety of antennas which are collecting these signals. Just as optical telescopes collect visible light waves, bring them into focus, amplify them and make them available for analysis, radio telescopes collect weak radio light waves, bring them into focus, amplify them and make them available for analysis. OVRO is a research facility of the California Institute of Technology (Caltech). It was brought into operation in 1958 with one 32-ft radio telescope, which was built at the Caltech’s Palomar Observatory and relocated at the newly established OVRO. By early 1959, the first of two 90-foot antennas was operational and soon thereafter the second was listening to outer space. “The two 90-foot antennas of the radio interferometer at Owens Valley, shown here after the completion of the dishes in 1959, formed one of the largest and most sensitive radio telescopes in the world. Each dish alone was larger than any in the United States at that time.” ~ The Owens Valley Radio Observatory: Early Years by Marshall H. Cohen. 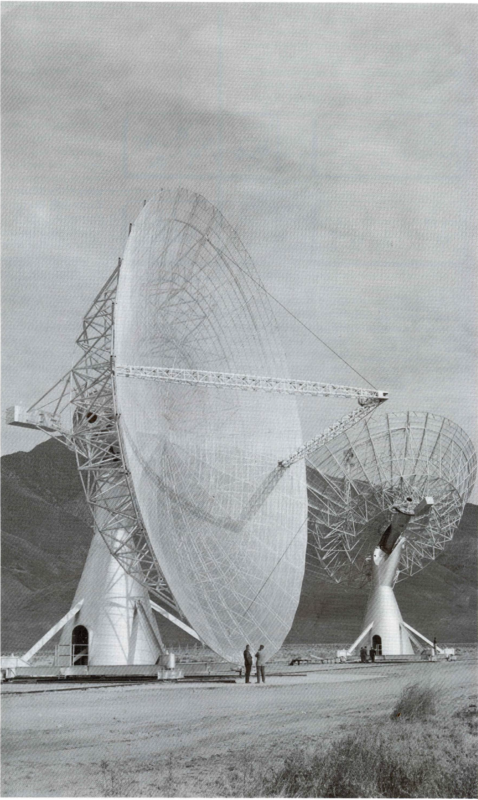 In 1968 a 130-foot dish became operational at OVRO, which was originally intended to form part of an array of eight 130-foot dishes. But by the time the first dish was built, the National Science Foundation diverted funding to build twenty-seven 85-foot dishes in New Mexico. 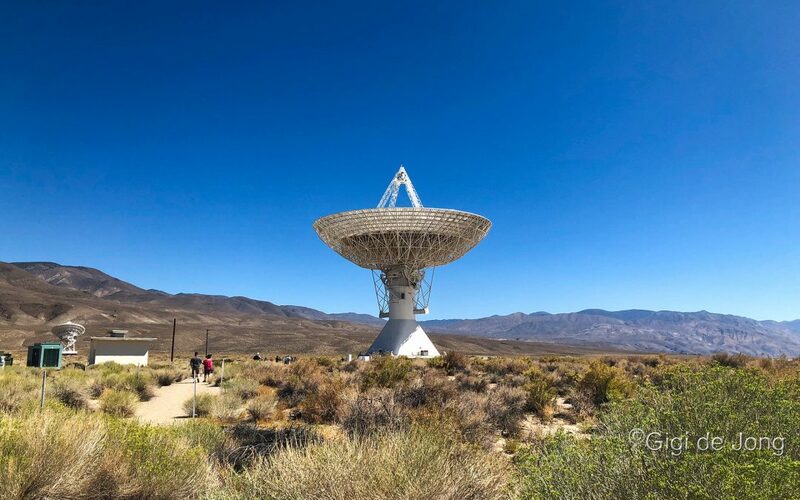 Nevertheless, the 130-foot dish at OVRO has produced valuable scientific results as a single dish as well as when it was paired with other radio telescopes around the world. 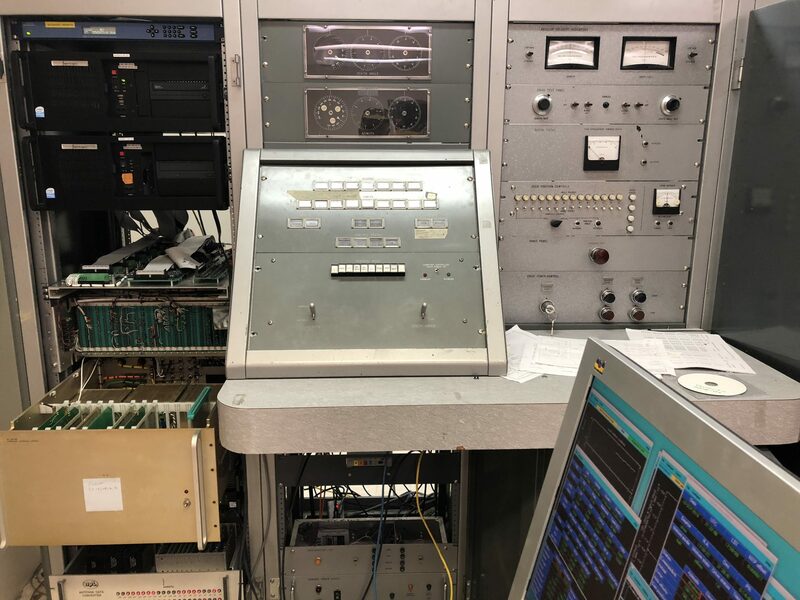 2018 marks 60 years of observation at the Owens Valley Radio Observatory. Little remains of that first 32-foot telescope, but the big dishes and numerous other telescopes, antennas, and arrays have expanded the reach and capacity of the facility. The scope of operation is extensive and world-class. OVRO now has the capability to ‘listen’ and analyze data using multiple different types of radio telescope technologies. Looking to the sky. 130 foot dish. The 130-foot telescope is still a vital instrument in radio astronomy 50 years after it was built. 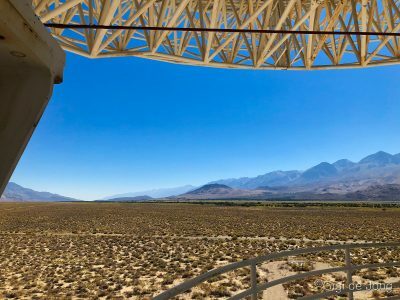 It is being used in conjunction with the Fermi Gamma-ray Space Telescope to monitor nearly 1200 blazars every two days – from right here in the Owens Valley. The Long Wavelength Array (LWA) situated at OVRO is a low frequency interferometer that is working in conjunction with another LWA in New Mexico. Together these arrays are studying ‘The Dark Ages and Cosmic Dawn.” The Owens Valley LWA is currently the most powerful radio telescope in the world, which operates below 100MHz. Another array, the Owens Valley Solar Array (OVSA), is one of the largest solar radio observatories in the United States. This project is a world-class facility for solar research at radio frequencies from 1-18 GHz. This is an area of national importance as scientists begin to understand the Sun’s influence on the Earth and near-Earth space environment – a subject broadly termed Space Weather. 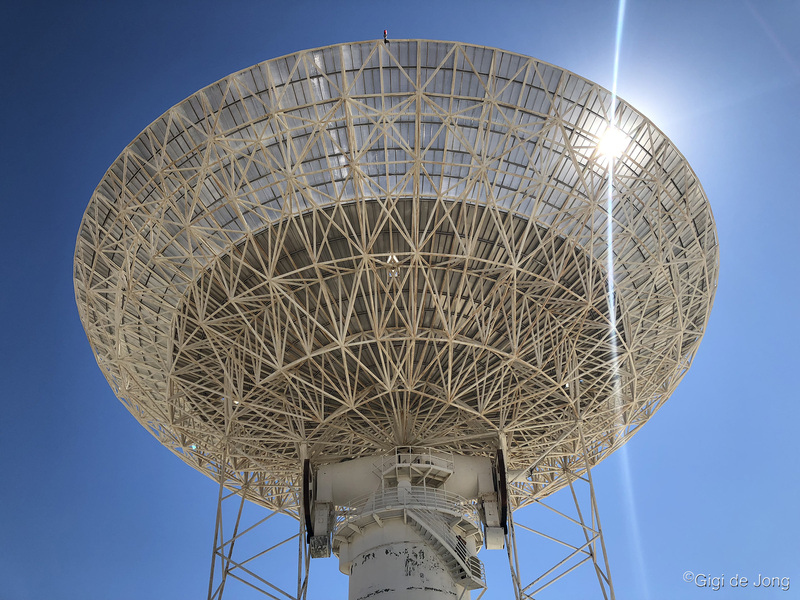 The Deep Synoptic Array, which consists of ten fixed-position 15-foot dishes, is searching the sky for very short, powerful radio bursts called Fast Radio Bursts (FRBs). FRBs are enigmatic – we don’t know what causes them, how far away they are or even where they come from. Data from Deep Synoptic Array will allow astronomers to pinpoint the source of a FRB and help them figure out what creates them. In what one of the astronomers calls ”the most technically challenging project we have ever done,” the CO Mapping Array Pathfinder (COMAP) uses a 34-foot dish to collect data to learn about galaxy formation in the early Universe. Further development of this project may see another four 10-meter dishes added for phase-2 of this study. This is a truly awesome facility to visit for aspiring and current scientists, astronomers, and anyone who has a keen interest in learning about our world – especially our extra-terrestrial world. A visitor could really ‘geek out’ at OVRO. The beauty of this facility will not be lost on the less scientific and more artistic members of a family or school group. The location is incredibly beautiful with the majestic mountainous background on either side of these technological marvels. 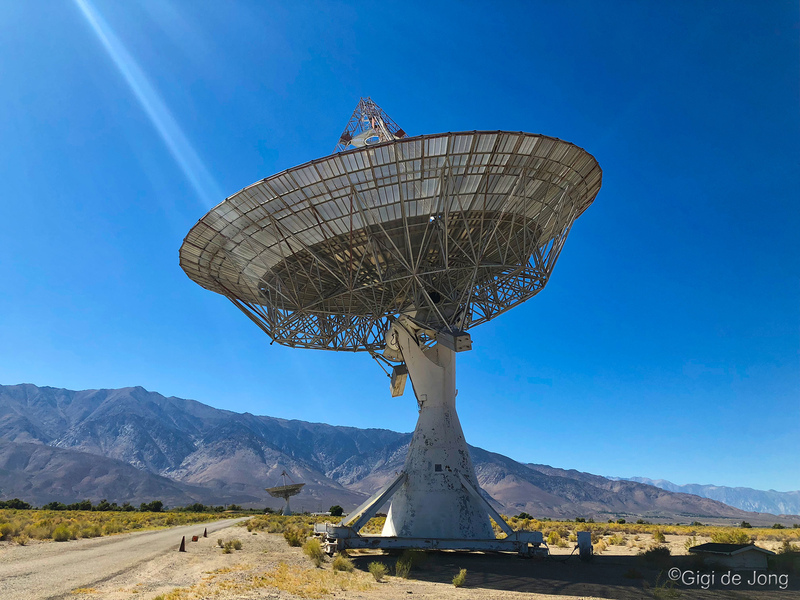 While much of the scientific data may be beyond the comprehension of most visitors, it is not hard to see how science and art are in perfect harmony out here in the high desert of the Owens Valley. Looking south from the catwalk of the 130 foot dish. 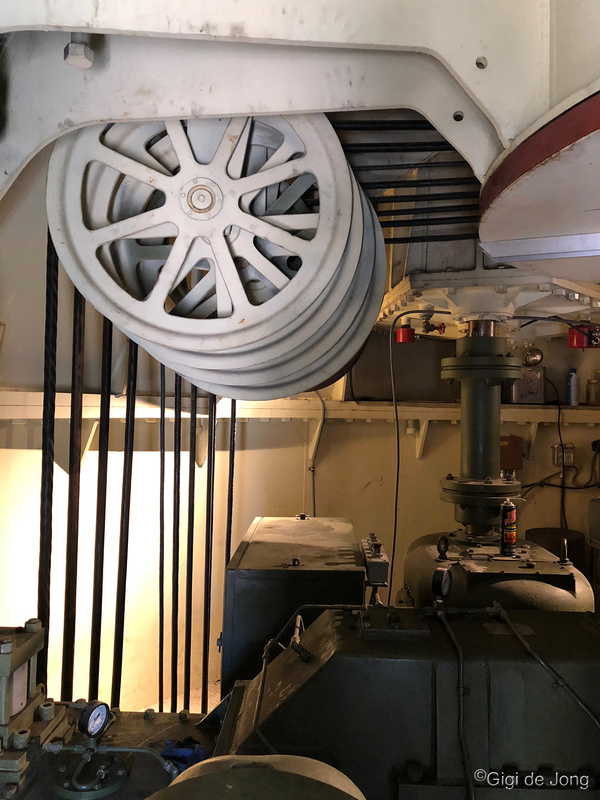 The Owens Valley Radio Observatory is operational year-round, and the facility offers free public tours on the first Monday of every month – unless it is a holiday, then the tour is on the second Monday. Tours begin at 1pm and last about an hour. Reservations are not required. Tours for school groups and large parties can be prearranged for other times by contacting OVRO at (760) 358-6410. 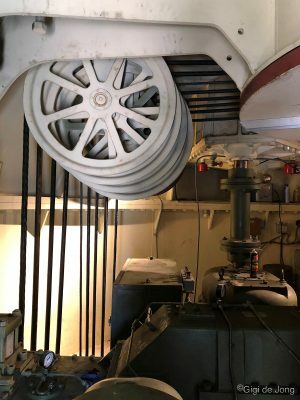 The pulleys inside 130 foot dish used to change the angle of the dish. A series of public lectures is also offered by the researchers and educators in astronomy and astrophysics from OVRO. Lectures are held once a month from August to December and are geared towards any member of the community with an interest in the sciences. 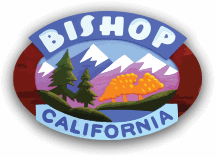 The lectures are presented at the Bishop campus of the Cerro Coso Community College. Original computers still in place, but now it runs through modern computers and programs. 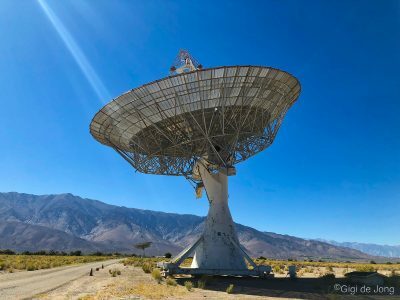 Located southeast of Bishop, the Owens Valley Radio Observatory is 6 miles from the town of Big Pine. 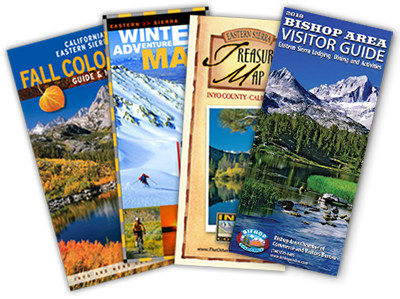 To get there, take US Highway 395 to just north of Big Pine and turn East onto State Route 168. Travel for 2½ miles then turn left onto Leighton Lane and go about 4 miles and through the gate. After a sharp left turn go about 100 yards and turn right on Robbie Road towards buildings #12 & #13. Tours start inside building #12 at the east end of the observatory. Detailed directions and maps are available here. For the geeks in the group the coordinates for OVRO are 37:14:02N latitude, 118:16:56W longitude at 1222 meters above sea level.